Devon Houseboasts superior purpose built student accommodation (PBSA) with numerous communal facilities including study spaces, a breakout room and cinema system, pool tables, a cooking/dining area, on-site gym and SMART technology, The development has for sale 162 large studio apartments and is located next to the main University of Liverpool campus and the Royal Hospital. Investors in UK Student Propertytypically receive bigger income gains than with other forms of Buy to Let property investing, much more income than from high street bank or building society accounts or even the best performing income bonds, with an national average NET return of around 7% per year. 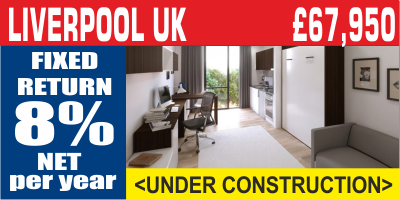 The number of students in higher education in the UK is booming and last year, for Britains 1.7 Million students, only 39000 purpose built bed spaces were developed, meaning that local supply for quality, desirable and secure student accommodation is by far outstripped by the growing demand for it.